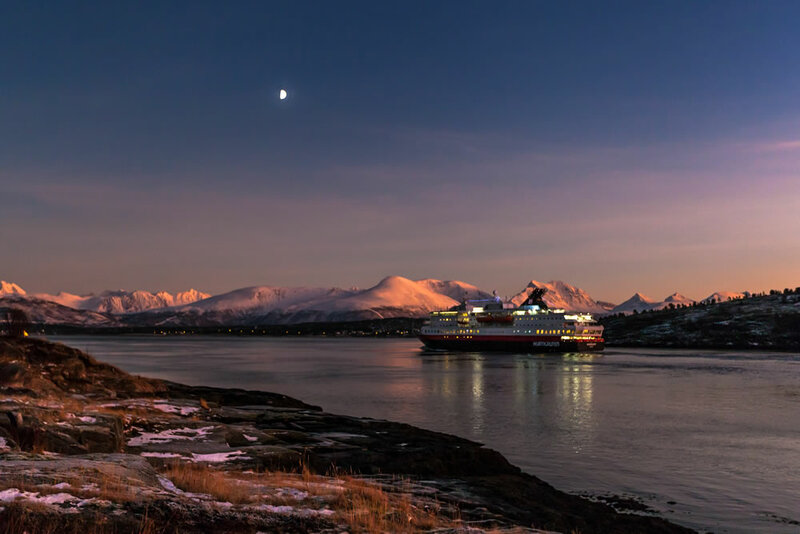 Hurtigruten has added 24 new direct flight options from seven departure airports between January and March 2016 to enable more customers to book fly-cruise sailings. Direct flights have been arranged from London Gatwick, Manchester, Bristol, Bournemouth, Newcastle, East Midlands and Dublin airports. The five- or six-day ‘Arctic Highlights’ is one of Hurtigruten’s most popular itineraries and ideal for those who are looking for a shorter trip, as it spends its entirety within the Arctic Circle. Optional excursions are available ranging from trips to the breathtaking North Cape (just 2,000km from the geographical North Pole), to husky sledging adventures and snowmobiling trips during the polar night. Flights are available for the five-day itinerary from London Gatwick, Manchester and Bristol, with prices starting from £949 per person including direct return flights, transfers, one night in a hotel and voyage from Tromsø to Kirkenes and back to Tromsø. Flights are available for the six-day itinerary from London Gatwick, Bristol, Bournemouth, Manchester, Newcastle, East Midlands or Dublin, with prices starting from £1,059 per person including direct return flights, transfers, and one night in a hotel in Tromsø. The eight-day ‘Arctic Explorer’ itinerary sails along the coast from Bodø to Kirkenes and back to Svolvær. Flights are available from London Gatwick and Manchester, and prices start from £1,349 per person including return flights and transfers, two nights hotel accommodation, plus a visit to the Lofotr Viking museum and Bodø Air Museum. The 12-day ‘Classic Round Voyage’ itinerary spends seven days directly under the aurora oval – reportedly the best place to see the Northern lights. Several times a year, renowned British astronomers are on-board to deliver a series of talks and lectures and join excursions on-land. Two astronomy voyages have been added for 2016, departing on 29 January and 2 March. Prices start from £1,575 per person (for the January departure) and include the voyage on full-board basis, return flights from the UK and a visit to the Tromsø Planetarium. Customers on these ‘Classic Round Voyage’ sailings will also be eligible for Hurtigruten’s Northern Lights Promise, meaning that if the Northern Lights fail to make an appearance during the voyage, Hurtigruten will give offer another 6 or 7 day Classic Voyage cruise next winter, free of charge (terms and conditions apply).